I wanted to share my favorite (MUST HAVE) beauty products right now! My budget is limited…. I don’t wear makeup everyday, so I find it hard to splurge on a ton of beauty products just to try! I am the girl that will return the $8 mascara to Target if I didn’t like it. 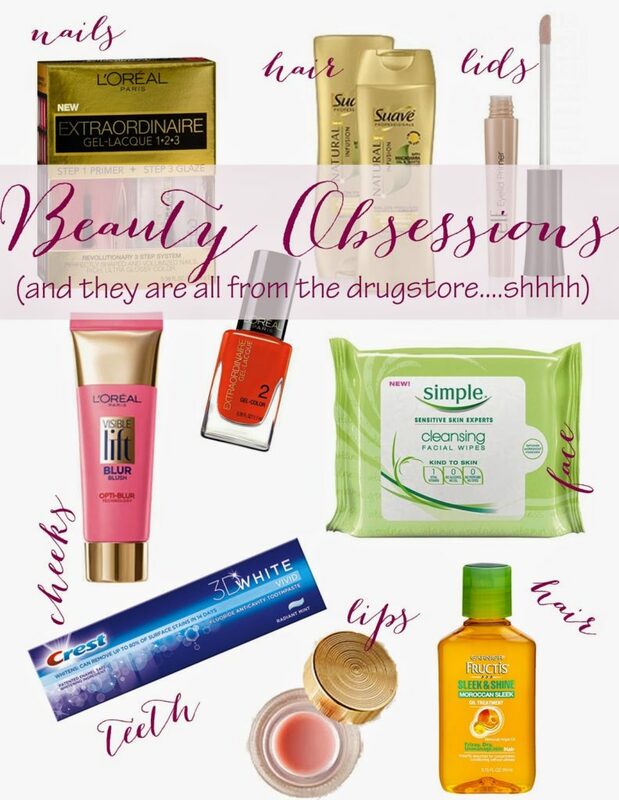 To be honest, I scour beauty aisles whenever I am out shopping, and there are just too many new and fun products to try and not return the things that don’t work for you. My actual claim to fame just normal, average, everyday life is that I am a licensed esthetician. I love talking about skincare and I would never tell anyone to try something that I personally didn’t try or like for myself. So, with that being said, here are my top beauty obsessions now. ALL of these products make me feel beautiful and feminine. They feel luxurious, but don’t have a hefty price tag. I can certainly get with that! simple wipes – I have really fallen in love with the Simple line. I also use the face wash for quick makeup removal. It is all so gentle on my skin, and its a plus that there are less harsh chemicals than in other products. I prefer these wipes over their exfoliating wipes! I use them every night before bed. fructis oil – I LOVE the smell of this stuff……oh so much! I apply is before drying my hair, and I get a sleeker softer look. loreal blush – so pretty, so soft, reminiscent of a facial primer. eyelid primer – I will try anything for a buck! e.l.f. actually will surprise you! I grabbed this primer in a pinch, and haven’t felt the need to spend the money to replenish my Urban Decay primer that I usually use. toothpaste – I have actually noticed a solid difference in the whiteness of my teeth. I have only been using this for about two weeks, and it has not bothered my sensitive teeth one bit. Loving it!You can actually go to their site HERE and get a coupon for your purchase! lip balm – Ok, this is the ONLY item not found at a drugstore. oops! I purchased mine at Anthropolgie. Who doesn’t want to pull this beautiful container out of their handbag? So smooth and gives my lips a perfect summer dewy look. suave hair care – Just try it! Love love love it! If you are a salon shampoo buyer, I challenge you to try this. Also, it smells amaaaaazing! I would LOVE to know what some of your favorites are right now!! Got any you would like to share? pretty please?